July 12, 1984 - The State of Texas House of Representatives, House Concurrence Resolution No. 94, signed by Texas Governor Mark White. "Be it additionally resolved that the Texas county of Bandera be declared the international headquarters for trick and roping, and be it further resolved that the city of Bandera be designated the trick and fancy roping capital of the Republic of Texas". April 29, 2013 - The State of Texas Senate, Senate Resolution No. 769, signed by David Dewhurst, President of the Senate, and Senator Troy Fraser. 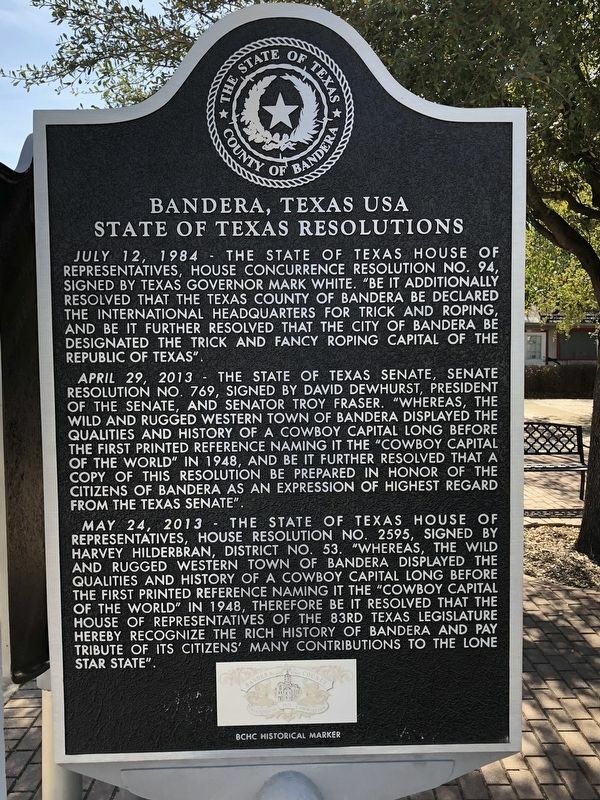 "Whereas, the wild and rugged western town of Bandera displayed the qualities and history of a cowboy capital long before the first printed reference naming it the "Cowboy Capital of the World” in 1948, and be it further resolved that a copy of this resolution be prepared in honor of the citizens of Bandera as an expression of highest regard from the Texas Senate". and history of a cowboy capital long before the first printed reference naming it the "Cowboy Capital of the World” in 1948, therefore be it resolved that the House of Representatives of the 83rd Texas Legislature hereby recognize the rich history of Bandera and pay tribute of its citizens' many contributions to the Lone Star State". Erected by Bandera County Historical Commission. Location. 29° 43.545′ N, 99° 4.353′ W. Marker is in Bandera, Texas, in Bandera County. Marker is at the intersection of Main Street (State Highway 173/16) and Hackberry Street, on the right when traveling south on Main Street. Touch for map. Marker is located in the Western Trail Heritage Park. Marker is in this post office area: Bandera TX 78003, United States of America. Touch for directions. Other nearby markers. At least 8 other markers are within walking distance of this marker. Great Western Cattle Trail (here, next to this marker); Bandera, "Cowboy Capital of the World" (here, next to this marker); Camp Montel C.S.A. 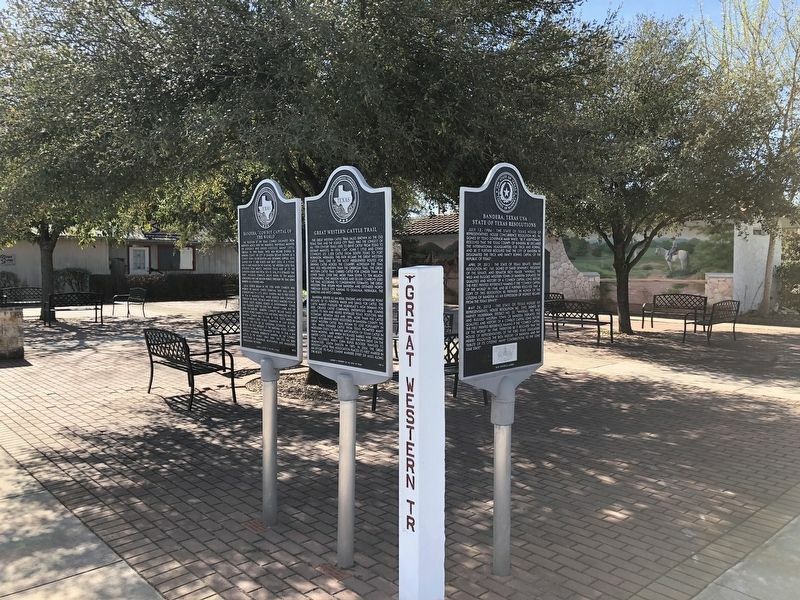 / Texas Civil War Frontier Defense (within shouting distance of this marker); Bandera County Courthouse (about 300 feet away, measured in a direct line); Mormon Settlers in Bandera County (about 300 feet away); Old Texas Ranger Trail (about 400 feet away); Captain Jack Phillips (about 400 feet away); Bandera Historic Town Center (about 500 feet away). Touch for a list and map of all markers in Bandera. More. Search the internet for Bandera, Texas USA. Credits. This page was last revised on March 1, 2019. This page originally submitted on February 27, 2019, by Brian Anderson of Kingwood, Texas. This page has been viewed 49 times since then. Photos: 1, 2. submitted on February 28, 2019, by Brian Anderson of Kingwood, Texas.